There are few things more self-indulgent than a blog. Here, I can express my opinion, and if no one cares, it's no big deal. If someone disagrees, I can delete his comments. The name of the blog, after all, is "MacBeth's Opinion" and nothing more ought to be expected. The name itself is a joke, after my brother Pete's appreciation of film critic Leonard Maltin. Maltin's Movie Guide is often referred to as "Pete's Opinion" in the family; when we want to know about a film, we consult "Pete's Opinion." The idea so amused me that I took it for the blog in honor of a stupid joke. I know, that's absurdly stupid, too, as there is no critic whom I consult. Yet, here, my opinion is actually what you'll find...only, this is actually my own opinion. Still with me? Now, to the point. Oprah has episodes of her show that reveal her favorite things. I have favorite things, too. So here is the first post of my Favorite Catholic Things. I love my fingers. There are ten of them; they are quite flexible. They are beginning to resemble my mother's fingers, but I guess that's just the way of things. They are great as a wake-in-the-middle-of-the-night rosary. But, you know what? I like real rosaries better. And I like beautiful ones. Sure, it's really all about the prayer, but we are tactile and visual people. A lovely set of beads is a help...and I need all the help I can get. It just so happens that in the wonderful world of social media, one finds lots of like-minded people. Fortunately, one also finds lots of quite skilled people. 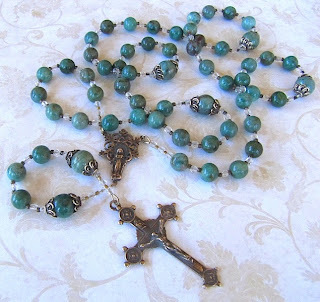 Some of my friends actually make gorgeous, inspiringly beautiful rosaries. 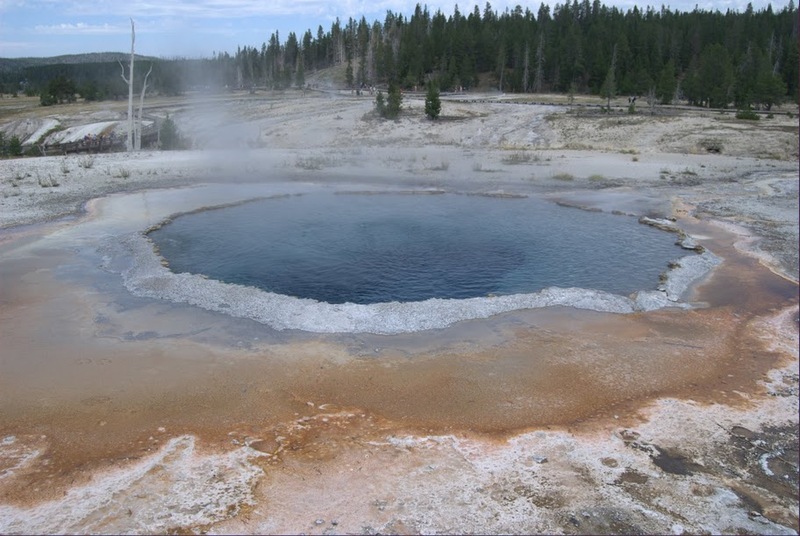 If you have a chance, take a look at these sites and see some real beauty. And check out Darlene's friend's site. Sometimes, the beauty of the rosary is in the intention of the makers...Divine Twine provides twine and instructions for making knots, for the cause of Autism Awareness. The beauty is in the colors, the task of knotting, and the prayers, of course. More information on the Rosary. 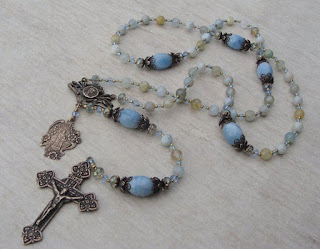 My favorite online virtual rosary site. Today, on the anniversary of his death, I would like to share some favorite lines, not from his more popular books, but from some many folks might not have read. "In Greek, I have started to read Homer's Illiad, of which, of course, you must often have heard. Although you don't know Greek & don't care for poetry, I cannot resist the temptation of telling you how stirring it is. Thos fine, simple, euphonious lines, as they roll on with a roar like that of the ocean, strike a chord in one's mind that no modern literature approaches." from The Collected Letters Of C.S. Lewis . It's rather like a spell to induce one's students to read Homer, don't you think? "No lawgiver, inner or outer, gives laws in a vacuum; he always has real or supposed facts in mind, an idea of what is, which influences his rulings about what ought to be. Thus the outer lawgiver ceases to make new statutes against witchcraft when he ceases to believe in it, and does not make vaccination compulsory till he thinks it will prevent smallpox. It is the same with the inner lawgiver." from "Conscience and Conscious" in Studies in Words (Canto) . "The knight is a man of blood and iron, a man familiar with the sight of smashed faces and the ragged stumps of lopped-off limbs; he is also a demure, almost a maidenlike, guest in hall, a gentle, modest, unobtrusive man." from "The Necessity of Chivalry" in Present Concerns . And my personal favorite Lewis quote: "Are you looking for an ashtray? Use the carpet." from an interview, "Unreal Estates" in Of Other Worlds: Essays and Stories (a wonderful and eclectic collection). I wanted to add quotes from Reflections on the Psalms and Letters to Malcolm: Chiefly on Prayer , but it seems as though someone has borrowed them (I suspect daughter #1). Perhaps next year. And a little advice to my children seeking spouses: Ask a potential mate in which order the Chronicles ought to be read. If he or she replies, "The order in which they were published," you have an excellent match. If the answer is, "The order in which they were written," it will work out well. An answer of, "Chronological order," means some couples' counseling will be in order. But if the answer comes quickly, "It doesn't matter," run for the hills. My grandmother was a diabetic, and as a young child I was fascinated by the whole thing, from her reusable glass syringe, to the little bottles of insulin, to the process of injection. I also learned that she had a special diet, from which she never deviated. Nonetheless, she sometimes fell ill, and would have to be taken to the hospital. It even happened on vacation once, and it was sometimes frightening. I know that Grammy was diagnosed with type 1 Diabetes as a young woman. She told me that one day she did not have the energy to climb the stairs of her church, even trying on her hands and knees. Doctors quickly discovered the problem, but insulin therapy was experimental, and only crude animal derived insulin was available then, and for much of her life, until synthetics became easy to manufacture. Despite following every protocol and instruction to the letter, her blood sugar was erratic. But because she did exactly as she was told, she became a great resource for those researching pancreatic function and insulin reactions. I understand she has been cited in numerous papers (anonymously). Pretty cool. Despite these ups and downs, she lived into her nineties, with all her extremities intact, though she did lose sight in one eye. She was a daily communicant, and knew everyone in her parish. 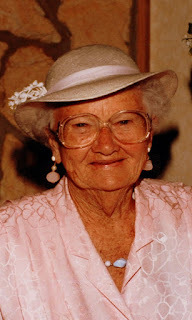 She sat in the front pew, sang boldly out of tune, and always wore a hat. She worked in a yard-goods shop, made all our clothes when we were little, always knit argyle socks for my grandfather, and quit smoking her Lucky Strikes cold turkey. A glass of wine before her nap, and a cup of black coffee after dinner were the only things I remember her drinking. She kept a glorious flower garden, which had a swing entwined with morning glories. And she made great apple pie and blueberry pancakes. Grammy never complained about her diet or injections. But one day, when we were at the mall, she saw the candy counter and paused. She pointed to a particular candy, and said, "Those are my favorite, but I can't have them." It wasn't a mournful, but a thoughtful comment. She smiled. "But," she continued, "I know what they taste like. I feel sorry for anyone who has never tried one." (I tried one, and didn't like it at all!) One does wonder how much of health is attitude, eh? I know this is a field trip that won't happen for my small group of homeschooled bacteria hunters anytime soon, but we traveled to Yellowstone a few years ago with my own family, and have photos to prove it. This was taken before our bacterial-hunting days, but it's a fine photo of hyperthermophilic bacterial (archea) growth patterns, demonstrating iron oxidation (rust colored sediment).